Who Let the #Cats #Books Out? As we leap into the new year, these two feline photo books are bound to catch your attention — If It Fits, I Sits and Pounce — a new high-flying title from Seth Casteel, the photographer who brought the world Underwater Dogs. #Cats and #Dogs Books Roundup! Christmas Eve Smackdown: #Cats vs. #Dogs Books! When families get together over the holidays, some relatives can’t help talking smack — even when it comes to their favorite pet books! So, Carolyn Kellogg of the L.A. Times breaks down this year’s best cat vs. dog book stocking stuffers! The Great Big Fat #Cats and #Dogs #Books Giveaway! There’s only one thing better than curling up with a good book — and that’s curling up with your pet AND a book! So, Vanessa Morgan of the well-traveled Traveling Cats blog, is combining two of our favorite pastimes by putting on a great big Rafflecopter giveaway of pet books — and you can check it out HERE! 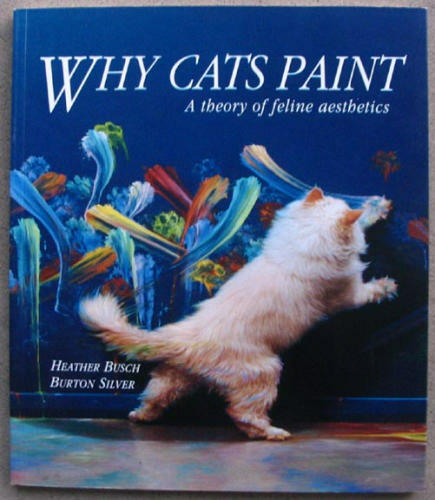 I know we’re all about the painted dog here, but I came across two vintage fine arts-loving cat books – Why Cats Paint: A Theory of Feline Aesthetics (by Heather Busch and Burton Silver) — a part humor, part Jackson Pollock depiction of cats playing with canvas. 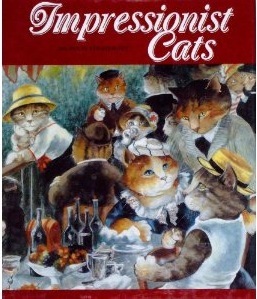 Then from Susan Herbert, there’s Impressionist Cats. They say you can’t reinvent the wheel, but Herbert has revised the masterpieces of French Impressionism with big kitties replacing their human counterparts — so move over Monet and Renoir because there’s a bunch of new cats in town!